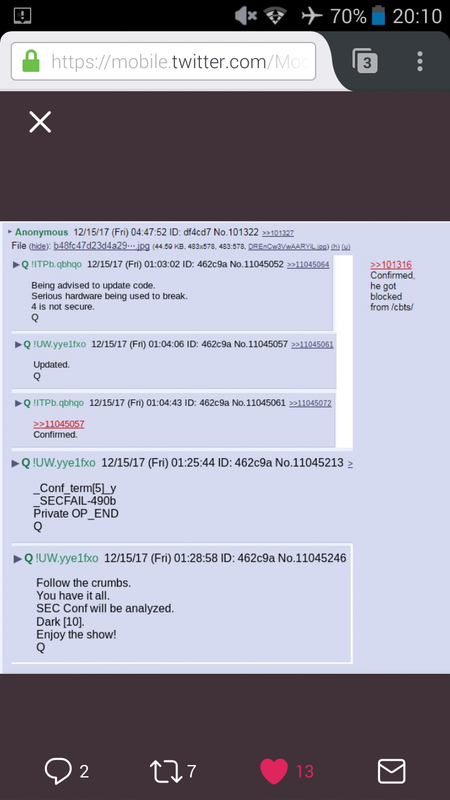 Have peeps seen this Q yet? Maybe the 10 days of darkness start today and end with Xmas? 10 days ends on the winter solstice. Can someone clarify why, right out of the shoot, when the first Strzok/Page texts were first released...it was stated that Page was Strzok's mistress? Have we seen any actual 'sexts' or love letters between them? It sounds as if the illicit nature of their relationship was being thrust upon us as part of a specific narrative. ...and THE BREAK begins with congress out of session. I wonder how many will return wearing boots. Dark for 10 days. At least it won't be so tough to keep up with this thread now. Every time I come back it's grown 3 or 4 pages. It certainly seems that wasn't the reason for the demotion of an FBI agent. You think that be reason enough to demote or fire them. So an affair with an American is ok but watch out if they are French or Chinese or Russian? Maybe tom de longe is Q ?